Over-sized teachers drafting tools are made of molded yellow impact-resistant plastic with pads on the reverse side for improved grip. These work great on any whiteboard or chalkboard. All measurements are printed in black type that can be seen easily across a classroom. All tools include an easy grip handle. 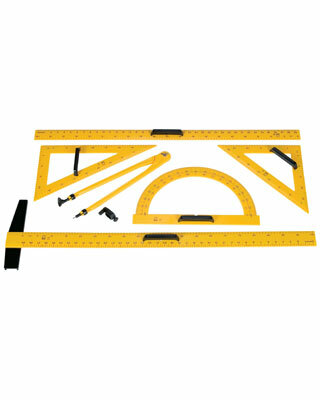 Set includes 180 degree protractor measuring 10" H x 18" L, a 45-45-90 degree triangle (10" H x 18" L), a 60 degree triangle (10" H x 18" L), a 40" inch/metric ruler with suction cup, 40" inch/ metric T-square with suction cup, and compass that easily accommodates standard chalk and the holder reverses to become a blackboard pointer, and a whiteboard adapter that will accommodate large whiteboard markers and larger chalk.